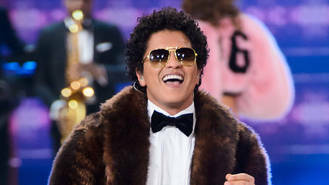 R&B superstar Bruno Mars received the biggest sales boost of any artist performing at the BRIT Awards last Wednesday (22Feb17). Bagging a coveted performing slot at the British music prizegiving in front of millions of U.K. TV viewers is known as a surefire way to gain sales and climb the pop charts. According to Britain's Music Week magazine Bruno's performance of his song That's What I Like caused sales of the track to rise by 180 per cent, causing it to move up to number 44 in the midweek update of the official U.K. chart. Another big post-BRITs winner was Emeli Sande, who not only performed her lovelorn ballad Hurts at the awards show but picked up the Best British Female Solo Artist award at the ceremony. Her album Long Live The Angels jumped 19 places to number nine in the U.K. album charts off the back of a sales boost of 146.6 per cent. Little Mix opened they event with a futuristic rendition of their 2016 number one Shout Out To My Ex,a track which was also named as Best British Single. After a steady decline in its position since topping the chart last October (16), the track leapt up the charts to number 24 after an increase of sales of 37.7 percent. Ed Sheeran performed a medley of his singles Shape of You and Castle on the Hill at the ceremony, but appearing did not affect his record sales much. However, despite an increase in sales of just 3.5 per cent, Shape of You is still on course to remain at number one for an eighth week when the official chart is announced on Friday (03Mar17). British grime star Stormzy, who joined Ed on the BRIT Awards stage for a surprise collaboration, also appears to have benefited as his new album Gang Signs & Prayer, released on Friday (24Feb17) looks on course to debut at number one after topping the midweek rundown. Kanye West has released a new track which stretches to a whopping seventeen minutes. TLC's fan-funded album is set to be released this summer. The BMW 750IL in which Tupac Shakur was shot and killed has gone on sale for $1.5 million. Bradley Walsh has inked a new deal with Sony Music CMG to release a second album after selling more LPs than Zayn Malik. Lily Allen is taking a break from Twitter after becoming the target of crude trolls online. Singer Lauryn Hill has postponed a Pennsylvania concert set for Monday (27Feb17) due to a scheduling conflict. Panic! At The Disco singer Brendan Urie has moved house to escape from what he called “constant harassment from fans”. Pop superstar Lorde has revealed she'll officially make her much anticipated musical comeback on Thursday (02Mar17).